After you have been married for decades, it is funny we guys can twist little casual comments from our girls into rational for more equipment, tools, or in this case a new AR15. 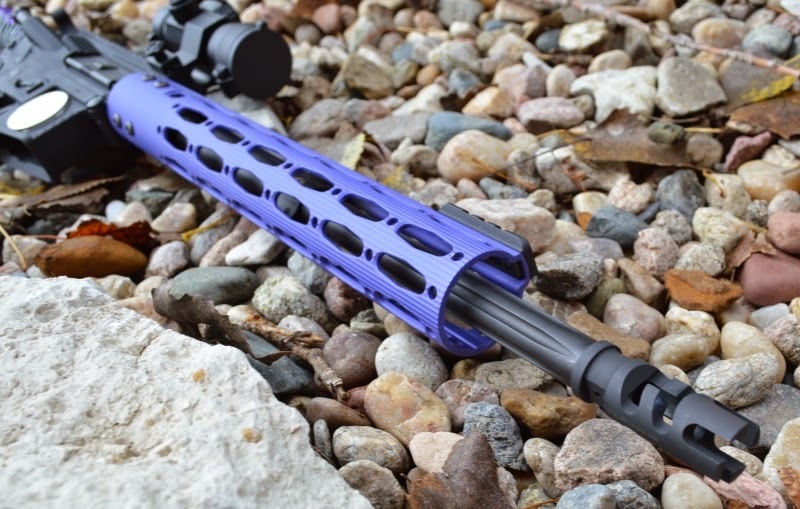 While utilizing Mrs. Pandemic as my style consult for custom and charity AR15 builds, she made the comment that a purple AR15 build at some point "...would be cool, but ya know, you never have any extra time for things for me." Knowing that purple was her favorite color and her birthday was coming up, I took this backhanded comment and translated it as "I need a brand new custom purple AR15"... which for the record was not at all what she meant. By the time I am dead I should it figured out that what a wife says is not what she actually means. Just like the iPad she never wanted for her birthday and his and hers Glock 19s for our 19th wedding anniversary, this too also worked out and became a thoughtful gift; somehow. The project started with the Black Rain Ordnance NY Compliant AR15 which I reviewed knowing that it would eventually be destined for other projects. 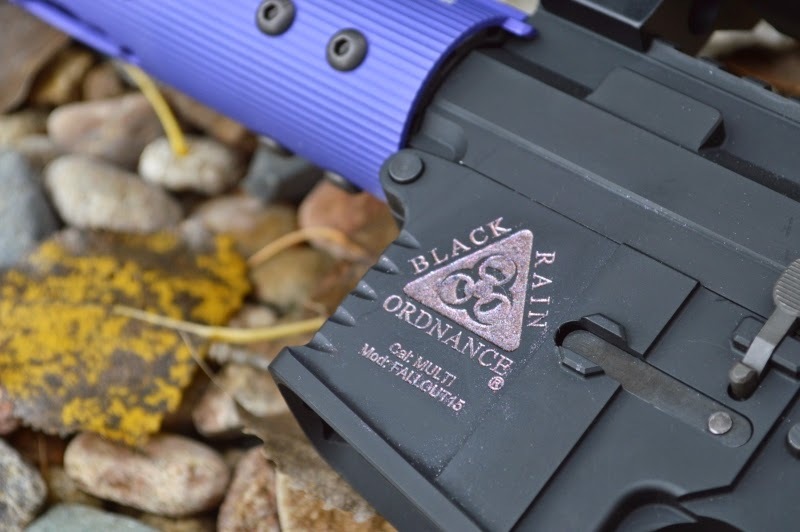 Mrs Pandemic loved the Black Rain Ordnance AR15s from the Mercury One events and the story and guys behind the company so I thought this was a great base platform for her custom build. The Black Rain Fallout 15 is loaded with all the custom features you could ever want... or in this case "she" could ever want. Obviously, removing the NY compliant components was not simple as the entire concept of these “compliance features” is not to make them easily convertible back to a non-NY Complaint gun with things like evil grips and adjustable buttstocks. That noted there is hope for NY compliant AR15 owners once they move to a “free” state. I had to grind off and destroy the buttstock grip nut to remove the special NY Compliant stock to install a grip and buttstock. Also destroyed in the conversion process was the muzzle thread protector in order to install a muzzle brake. Once freed of those restrictive NY Compliant parts, I installed a PWS FSC brake, Magpul grip, and Ace Doublestar Ultralight stock. The base features of Black Rain Ordnance Fallout 15 AR15s are impressive with billet upper and lower receiver sets, NiBo BCGs, extended billet charging handle, match BRO trigger, billet extended charging handle, anti-rotate pins, match grade .223 Wylde stainless melonited black barrel, and adjustable gas block. Black Rain Ordnance rifles are loaded with all the components you would expect on a top shelf custom AR15s right out of the box. My challenge was that I was a little unsure about coatings and how to get to the purple theme going. The answer came to me while cruising ALG Defense site where I saw their gorgeous Ergonomic Rails were available in bright purple... perfect. These are excellent rails for the price and actually one of my favorite new lightweight rails on the market. I have even used them on several charity and custom editorial reviews and love them. 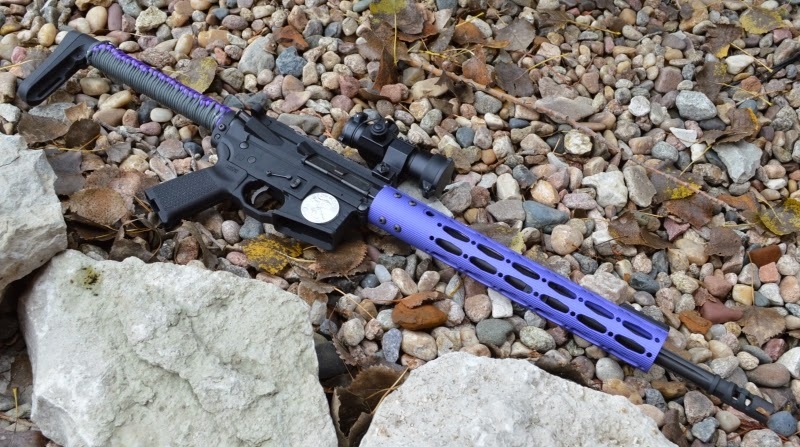 Order placed and I had my first purple component and I felt I was half way there to delivering a purple themed rifle. 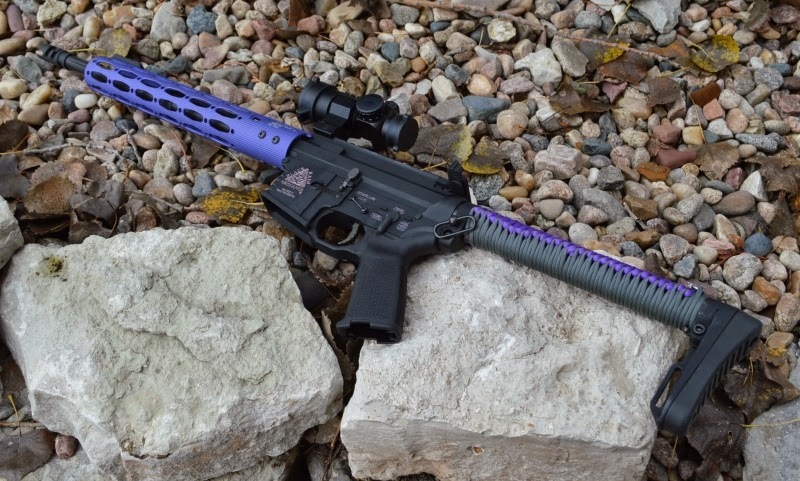 After a bit of pondering, I decided that custom lacing the Ace UL stock with some Paracord.com purple paracord would deliver the Purple Passion AR15 look I was going for... erh, I mean that she wanted. Mrs. Pandemic does already own an AR15, however I wanted to make this a fun gun which delivered near recoiless shooting. A huge piece of this equation was tuning the stock Black Rain adjustable gas block. Another part of recoil reduction was going to the ACE UL stock's rifle length buffer, spring, and tube. 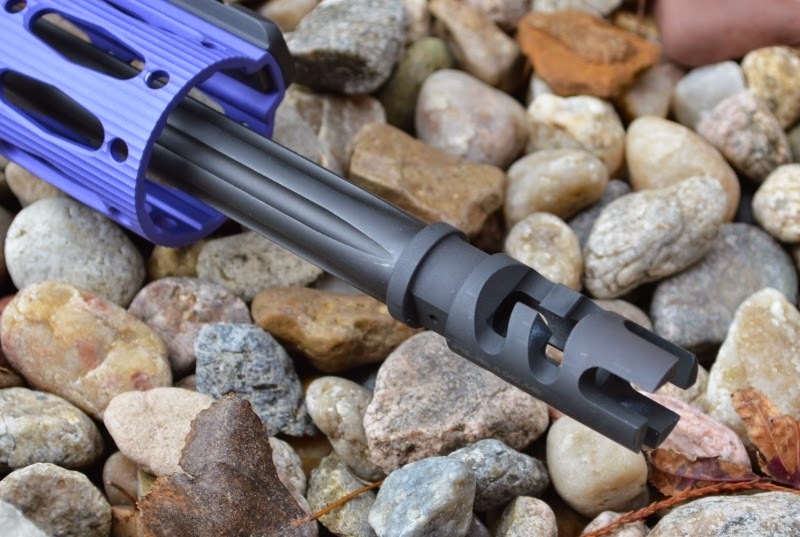 A rifle length buffer assembly will also drastically cut and soften felt recoil. Another component which drops recoil is a very aggressive (read that as loud) muzzle brake. 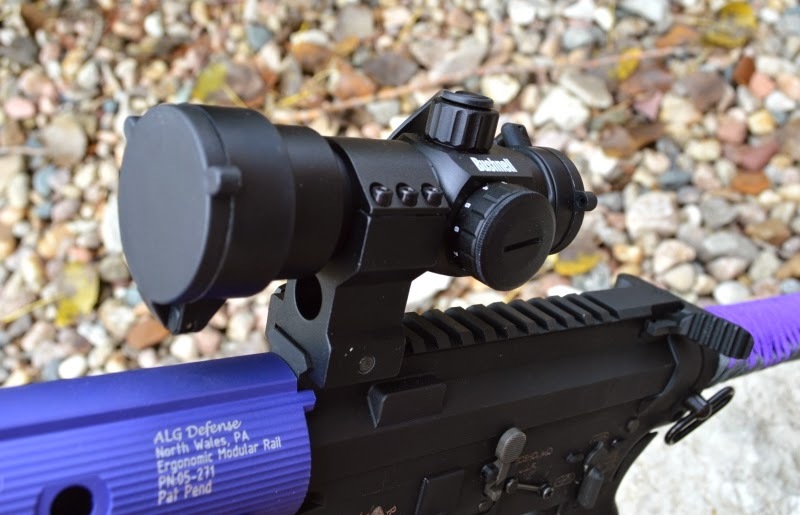 I have been extremely impressed with the braking effects of the PWS FSC brake for AR15s to take the bite out of any recoil. Between these three components the final recoil felt about like shooting a .22LR with almost no recoil and is crazy fun and comfortable to shoot. 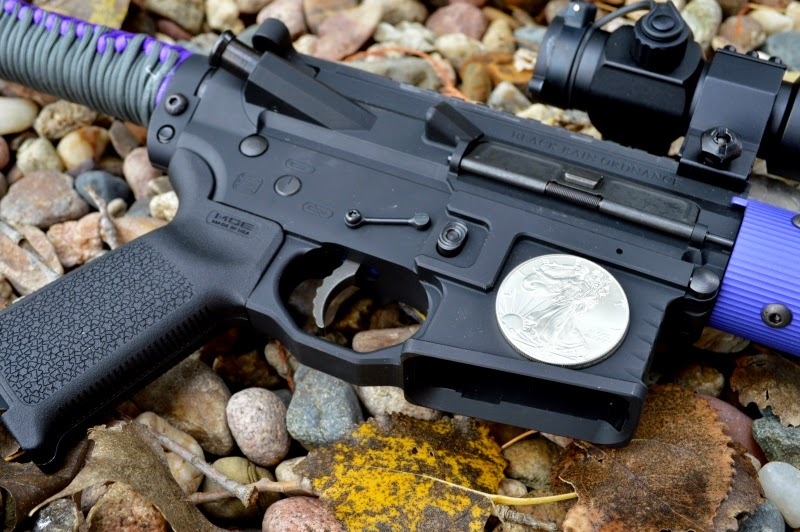 Actually this rifle is one of the softest shooting AR15s in my... I mean, "our" safes. Sure I could have gone all high rent with a top shelf red dot, however the $80 Bushnell TRS-32 has become a favorite durable, clear, fast shooting, and reliable red dots that does the job and is easy to use. I did want to add a bit more bling to the gun and really struggled with what emblem I could add to the side of the receiver. In many of the charity builds I have used challenge coins on the sides of the receivers and the look has been amazing. My wonderful wife would have loved a pewter or sterling silver skull on the side of the gun. Really should would have. After a month of searching turned up nothing that would fit or look good. Then brilliance struck me as I was picking up a few 1oz silver coins which were just gorgeous. 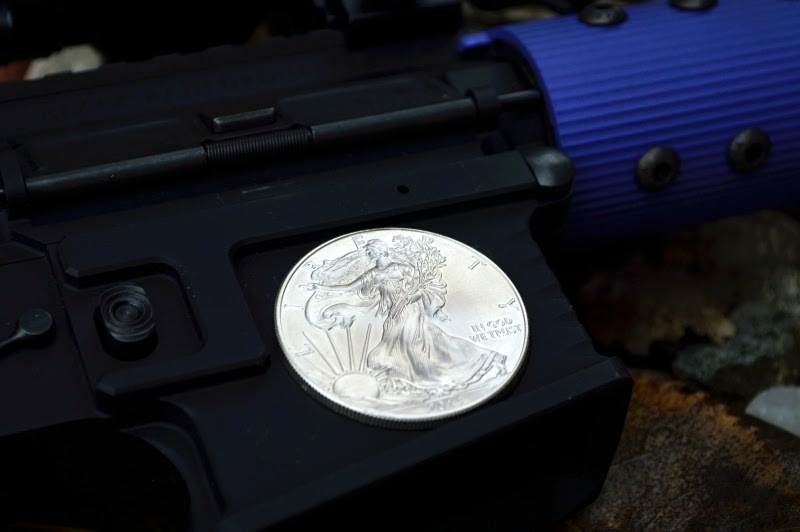 Why not just use a 1oz silver coin on the side of the receiver with Ms. Liberty? You would think that a coin of this stature and quality would be expensive, however it was just $3 over the $22 spot price per ounce. $25 and I had my unique little add on bling for my wife's Purple Passion rifle which was easily affixed with just a dab of Devcon 2-ton two part epoxy. Another little custom tweak was using her favorite purple sparkly nail polish for color fill on the logo. If you Youtube color filling, there are many how to demos on using nail polish for color fill. Basically just clean the area really well with nail polish cleaner an a Q-tip, dry and then brush a couple coats of polish on the area, let dry “a little” and then wipe off the extra with a nail polish soaked Q-tip. A little patience delivered a custom touch which looks far better in life than in the pictures. Well... like almost everything I seem to buy or make her as a gift, it took some warming up. Of course walking into the jewelry store can light up her eyes, however other things do not elecite the same excitement initially. 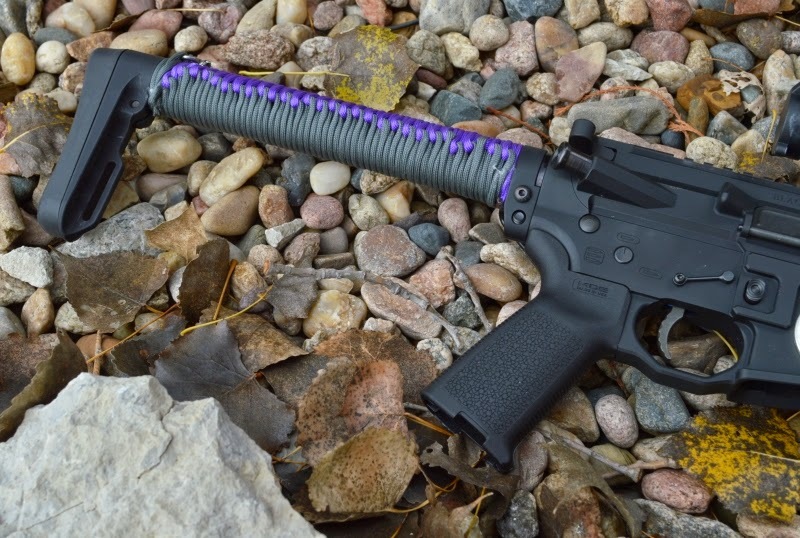 The Purple Passion AR15 was presented to her on her birthday along with a custom set black diamond. She was excited over the diamond, however a bit "less excited" over the AR15. “Appreciation” would be the term her excitement that is until I got her out on the range. It is true that the way to a girl's heart is diamonds, however you can at least put a big smile on her face by handing her five magazines full of 5.56 Nato and a new soft shooting custom AR15. 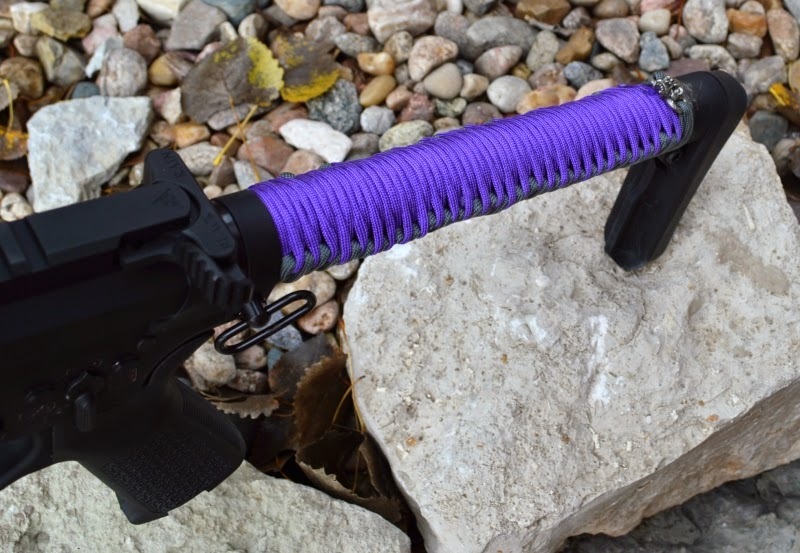 About three magazines in with the barrel smoking a bit and she had that sparkle in her eye which told me that she loved it and began noting all the custom little nuances I had added such as the paracord stock, silver coin, and purple handguard. What she loved was that it had virtually no recoil. Girls are funny, however the smile still on her face an hour later told the story that yet another creation by yours truly was a another awesome gift that grew on her.